In circumstances where working with aggressive chemicals is common, there are clear risks to the workforce, but with strict health and safety in place and adhered to, the risk can be greatly reduced. Aggressive chemicals also pose a risk to the equipment that they come into contact with on a daily basis, with wear and tear being an all too common problem in the chemical business. In order to combat these risks to machinery and equipment, the solution is to use chemical resistive coatings in the form of very thick, fluoropolymer applications. 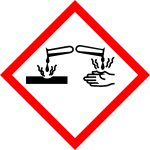 Companies that are making or working with extremely aggressive chemicals, including strong acids and heavy-duty alkalis, can often find that working with these substances will cause problems with the equipment used during the production process. • Lost production: If the equipment is worn out or has failed. • Slower production lines: If surfaces have become more adhesive. 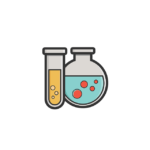 • Contaminated product: If metal and other material from the equipment’s surface has leached into it. • Increased employee risk: with potentially degraded equipment, there is a higher chance of employees either coming into contact with corrosive substances or being injured by malfunctioning machinery. In order to minimise the chances of any of the above problems occurring, the best solution is to utilise a very thick fluoropolymer coating, such as Halar or PFA, which acts as a chemical resistant substrate for any machinery or equipment it is applied to. This coating will need to be anything up to 1mm thick, which may not sound all that much, but in coating terms is a very dense application. 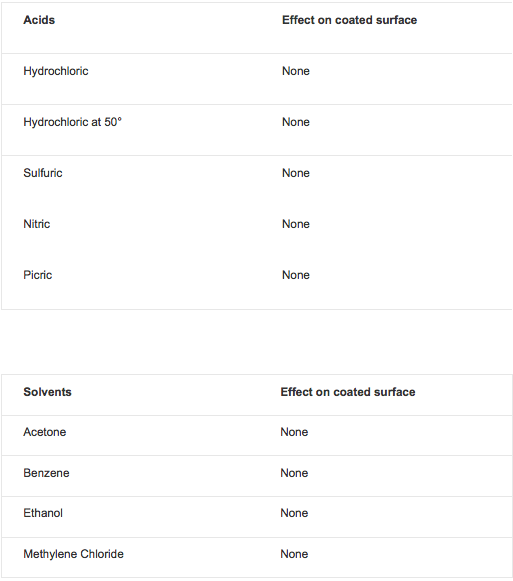 The below table shows the results of tests of a number of different acids and solvents, none of which had any impact on the surface once it had been coated. What are the advantages of coating the equipment? • Fluoropolymers are essentially inert to chemical attack. 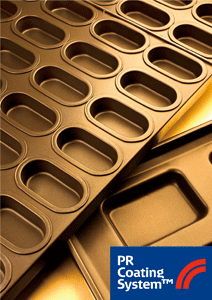 Providing the film thickness of the coating is built up, this will eliminate any porosity on the equipment’s surface. • Fluoropolymer coatings isolate the metal component in the equipment from the chemical product thus avoiding dangers of metallic contamination. • Lining the pipes, tanks and any other production machinery/equipment with a multilayer fluoropolymer can help to accelerate the production line, due to its non-stick quality. Adhesion will be greatly reduced, therefore the production line accelerates. • A company that coats its equipment with a multilayered fluoropolymer will benefit two-fold: the mean time between equipment failure is extended and the costs of refurbishing the equipment is substantially reduced.